Long did I ponder upon the weighty matter of which character would be the best use of the level 90 boost. A rogue, perhaps? No, I’ll never play it. What about Pixelby, the warrior, who just happens to be conveniently stuck at level 64? “NO,” said Cav, who insisted I had to learn warriorioring the hard way or I was no warrior at all. A blood elf paladin maybe? That way, I could have a paladerp of my preferred faction, and since it would be 90 to start with, that would be 90 whole levels where I wouldn’t have to listen to the emotes! 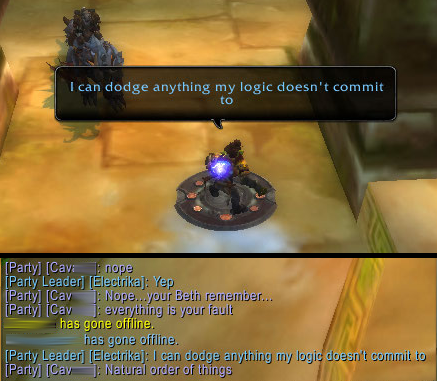 No, that wouldn’t work, I’d still emote by accident sometimes. Like all those times I type “haha” in party chat and my character laughs out loud in the instance for no apparent reason. 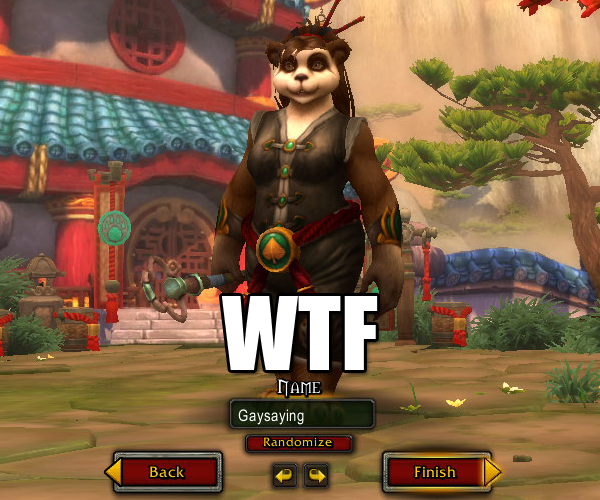 He literally had to switch chars, mail his looms to himself, tele out to get them, and tele back in. Bombelina’s Resto/Elemental, for which she carries around two sets of gear. (I know the required stats are similar, but they’re not the same!) 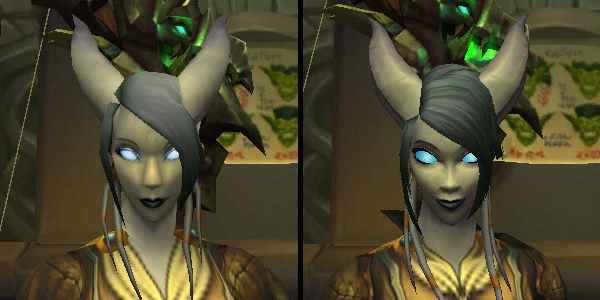 I initially didn’t pick a second spec for Yynsia due to bag space, but since she’s gotten Exalted with the basic factions (and therefore has purchased the 16 slot bags they offer) and has picked up a netherweave bag or two, that’s no longer an issue. She started off with Resto for quick queue times. But then I finally hit the levels when all you get via LFD is hell Blackrock, so I finally picked up Enhancement, just to do something different. There was just one problem with this plan – all my mail agility heirlooms seemed to have gone missing. I checked every. Single. Alt. I checked everybody’s Void Storage (if they’d unlocked it, that is). I checked all the alts under level 10 (see: Moolastrasza, Aspect of the Cowflight**). 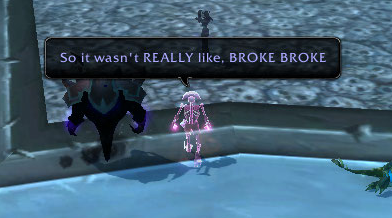 Hell, I even checked the random DKs sitting in Acherus (see: Mooalisa, Masterpiece**), just to make sure that I hadn’t sent the looms out there for safekeeping, or something. You know. Hoping for a miracle. I hadn’t, of course. They were all gone gone, kinda like how sometimes, things get broke broke. Just work with me here. Fortunately, all was not lost. While item restoration never occurred to me because I am a big derpface, Bombelina and Ignitine have both been max capped on Justice for some weeks now. 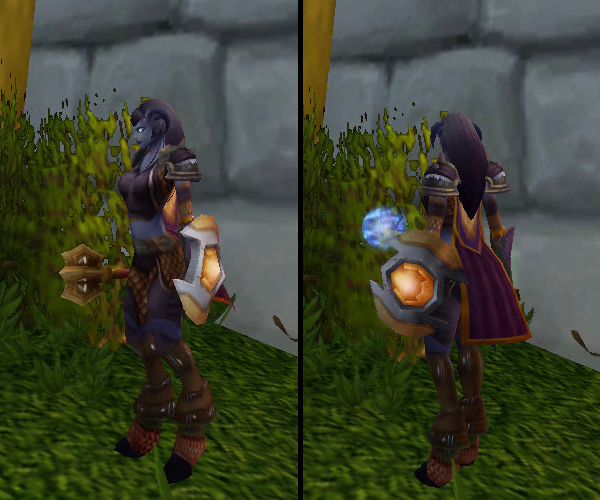 Since Bombelina’s gear hasn’t changed recently, I haven’t been dropping my precious gold on reforging and enchants, and thus was able to purchase the guild heirlooms instead! 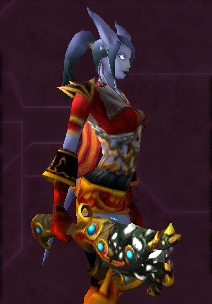 My problem then became the dire need for a pair of gloves and some dang transmog. I’ve interrupted leveling to go get some quest items together. Once that is taken care of, it’ll be time to finish the run to 60 and then … the magic jump to 90. This is what I imagine logging in on an insta90 is like. 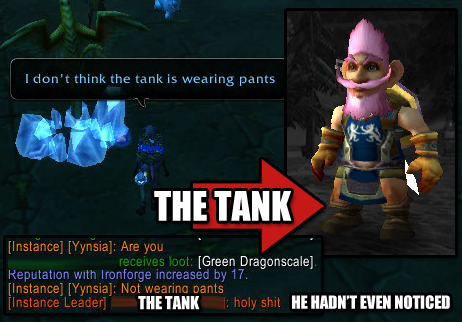 I’m told LFR has been exceptionally special this week. Gee, I wonder why? * I don’t know why Blizzard insists that I can’t understand big numbers. I UNDERSTAND MILLION+ CHAOS BOLT CRITS QUITE WELL, THANK YOU VERY MUCH. 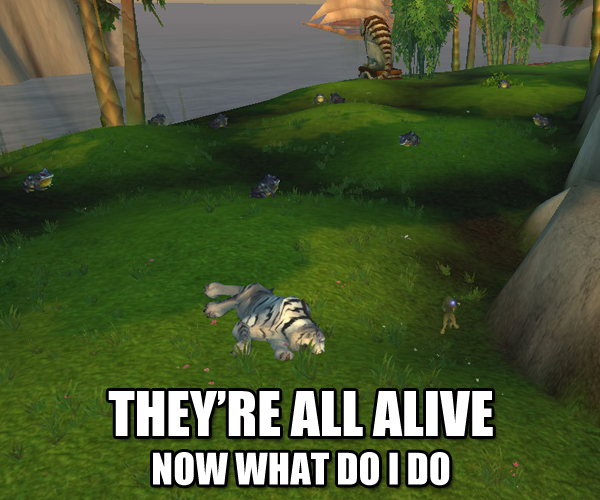 ** I was going to make a Tauren guild called the Mooguardians on Moon Guard, but then I got lazy. This entry was posted in Alliance Dalliance, Draenei From Space, World of Warcraft, Yynsia and tagged draenei, level boost, leveling, world of warcraft, yynsia on March 20, 2014 by Prinnie Powah. I’ve been superbusy, you see, not because of the holiday but because of the whole ability to mail heirlooms to different servers. 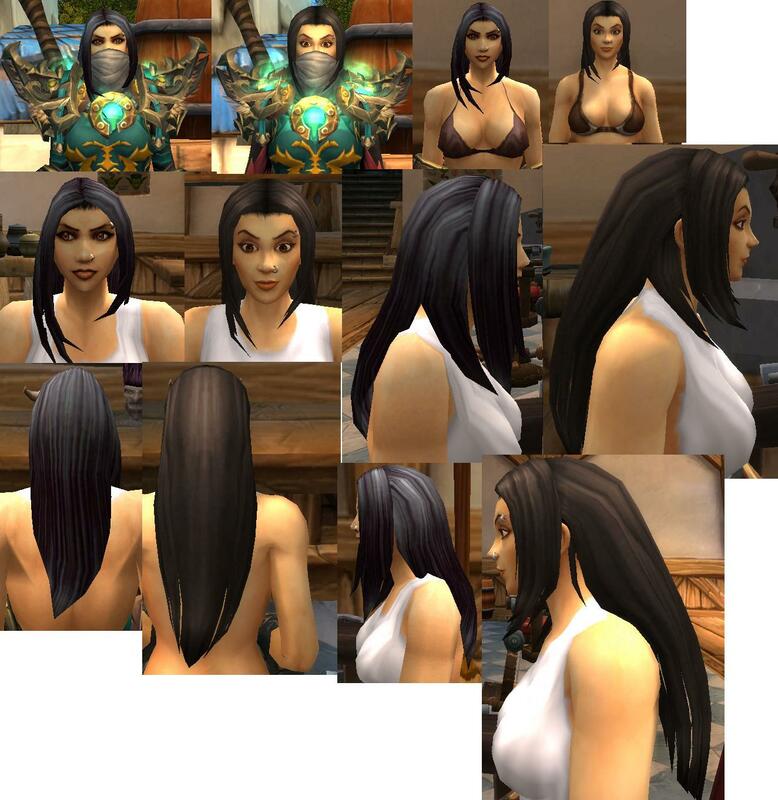 THANK GAWD FOR MORE TRANSMOG STORAGE SPA… I mean, uh, yay! More leveling! I’ll be damned if messing around on the character creation screen isn’t fun, so I’ve ended up with a sea of small-time alts that I may never actually do anything with. Only one of ’em has achieved “having a spec” yet. Is Blizzard setting me up to be reported, maybe? I swear to Gawd I did not shop that name in. 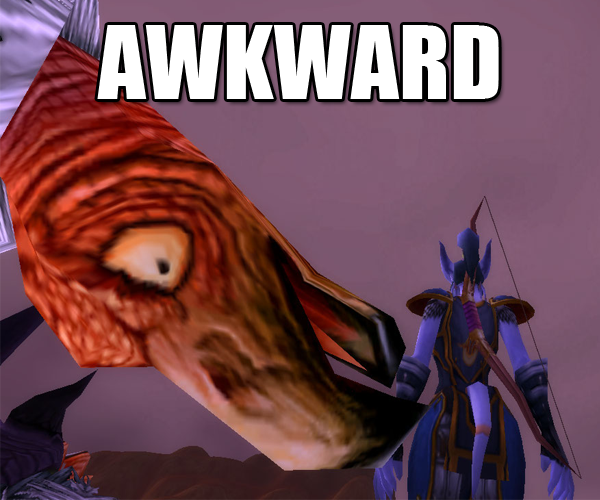 At this point, I’ve decided to “focus” on two of the alts, one Horde, one Alliance. Splattini is a goblin disco priest, created with three goals in mind: learn how to dance Atonement heal, stalk Rep (since Rep moved some characters to that server, which isn’t PvP! ), and maybe someday see her idol, Fabulor, in all his fab glory at the Shrine. 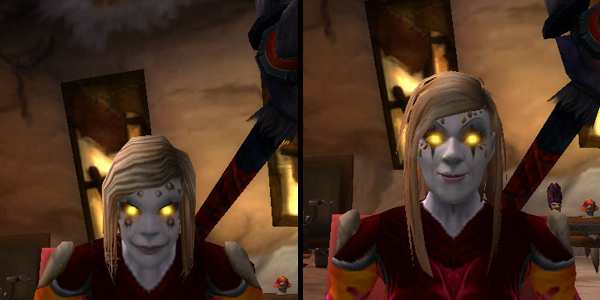 You know, someday, when she’s dressed to impress better and when she’s like … not level 13. 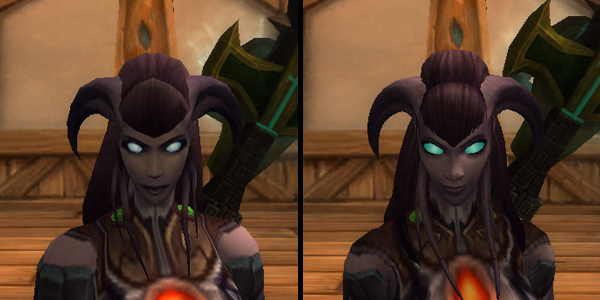 The other would be Yynsia, a draenei shaman who hasn’t picked specs yet. 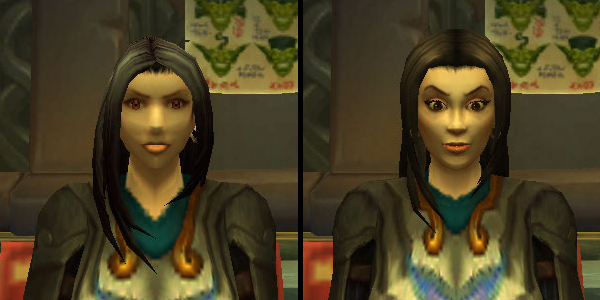 One of them will definitely be resto, because I’ve been tempted to level another Alliance healy-type. That way I can bring a different character to the Old Ladies Raiding Guild when whim strikes, and healers are always useful. The big question for Yynsia is – enhancement or elemental? On the one hand, I’d like to try enhancement, and I’ve got all the mail agility looms. On the other hand, while you can mail heirlooms across servers now, the same cannot be said of money or, most importantly, bags! I’m not sure if or when she’ll have the bag space to carry two sets of gear! 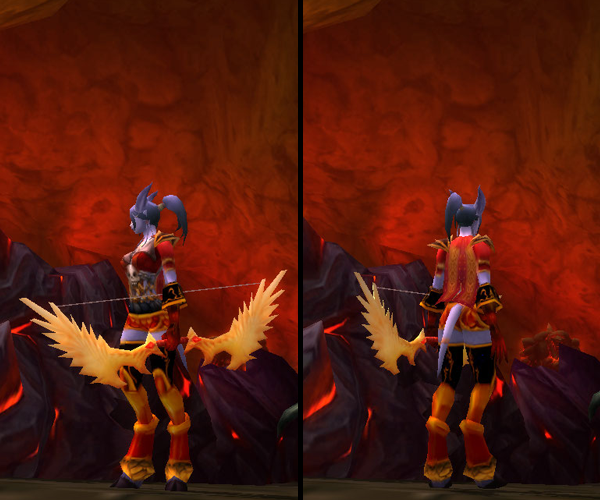 Lastly, when did I end up with two sets of leather agility heirlooms? Well, you know what THAT means – TIME TO MAKE ANOTHER ALT. You act like I got a problem. 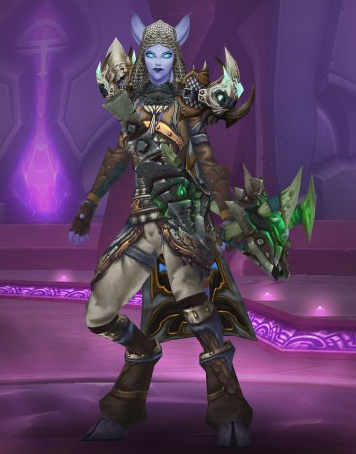 This entry was posted in Alliance Dalliance, Draenei From Space, For the Horde, Baby!, Goblins, Splattini, Unfortunates Who Didn't Make It, World of Warcraft, Yynsia and tagged /omg, altoholics anonymous, draenei, goblins, heirlooms, maybe someday will be better, splattini, that's awkward, that's probably not good, world of warcraft, yynsia on December 19, 2013 by Prinnie Powah.